ProFLEX Heated Insoles are just what you need to keep the cold at bay this winter, keeping your feet warm without getting them too hot and making them sweat. It's the best way to keep your feet warm while enjoying the great outdoors. ProFLEX offers even more comfort and ease-of-use than Original Heated Insoles, utilizing a flexible polyurethane insole material, a comfortable and resilient Poron battery cover cushion, and a removable, rechargeable battery. Heated Insoles offer convenient remote operation, no worries or external batteries, and at least 2500 hours of use or about four winters of heavy use. 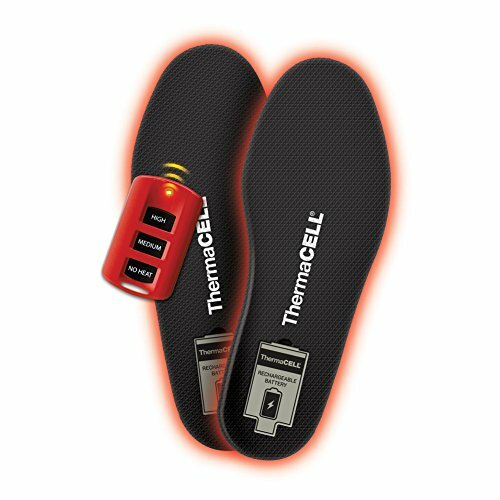 Using ThermaCELL's ProFLEX Heated Insoles is easy. Simply adjust the temperature utilizing the wireless remote control to the setting of your choice: no heat (standby), medium (100 F), and high (111 F). Recharges in 4 hours using wall charger or any USB port. Recharges at least 500 times. Charge lasts up to 5 hours of constant use (on medium heat setting). Package includes: 2 Heated Insoles, 2 rechargeable batteries, 1 remote control with battery, 1 smart charging case, 1 wall charger, 1 USB cable, 1 instruction booklet. Fits men's shoe sizes 11.5-13 and women's shoe sizes 12.5-14. Charge the batteries using the included wall charger or a USB port. Superior material, polyurethane foam is breathable, transfers heat efficiently, has great shape retention and shock absorbency.